UNBELIEVABLE … Don’t condemn present day Islamic jihad because of what took place centuries ago … STUCK ON STUPID! Some body owes every one a big apology. UNREAL, we are not supposed to condemn jihad that goes on in present day society every day because of what took place centuries ago? ARE YOU INSANE?!!! That’s correct folks, according to Cuomo do not condemn cutting the heads off of the infidels and news reporters like Danny Pearl, do not criticize the killing of innocent civilians by suicide bombers and by all mean America … you must not condemn Islamic jihad when they fly planes into buildings on September 11, 2001 and kill nearly 3000 innocent people. Not only does Cuomo show his complete stupidity and PC run amok in typical MSM fashion, as NewsBusters points out, he also shows his complete ignorance of the facts. However, in typical liberal MSM fashion, why would they let the facts get in the way of liberal bias? In a tweet Aug. 26, ABC “20/20″ anchor Chris Cuomo told his 987,000 followers not to condemn Muslim violence because other religions have perpetrated violence in the past. “To all my christian brothers and sisters, especially catholics – before u condemn muslims for violence, remember the crusades….study them,” Cuomo tweeted around 9:30 am. So does past violence justify modern violence? 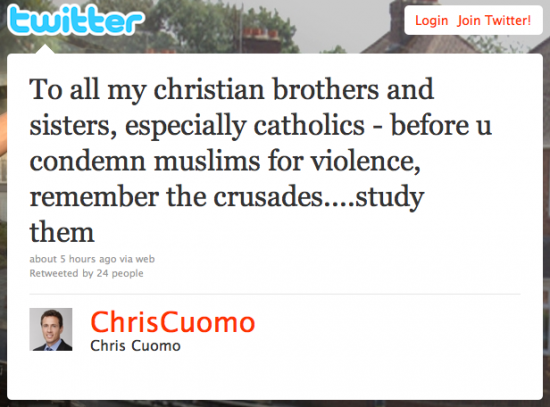 If so, maybe Cuomo should take his own advice and study the Crusades. Even a brief study would reveal a much more complicated situation than Cuomo’s tweet suggests about who struck first. Historians, including professor and author Bernard Lewis, have noted that the Crusades were in fact a response to jihad. “The Crusades could more accurately be described as a limited, belated and, in the last analysis, ineffectual response to the jihad – a failed attempt to recover by a Christian holy war what had been lost to a Muslim holy war,” Lewis wrote in the Wall Street Journal shortly after the Sept. 11, 2001, terrorist attacks. When you are stupid it’s never a good idea to shout it from the roof top. Chris is a fool and has confirmed that we shouldn’t ever take him seriously. His brother Andrew has jeopardized his run for governor by supporting the ground zero mosque. And, last but not least, is Mayor Mike and his over the top statements and his betrayal of NYC and of all the victims of 9-11. If he has any political ambitions when his term of mayor is over then that is when he will realize that he self destructed. They are all in the same category as Pelosi and Reid and who in their right mind wants to be in that category. Cuomos great x 1000 grandfather Gubb stole my great grandfather x 1000 Grogs’ fur toga and I want reperations mother f*&@#$r! By this morons standard war should never end, so be it. Give back your american dream azzhole, you just forfeited. their thugs to participate in Beat Whitey Night. the KKK is the terrorist arm of the democrat party. remember that cratties when you babies start crying racist and racism. Funny thing is other than the KKK…muslems are the only folks I know putting white sheets on their heads. anyone else notice this? Or just me? I do not accept this drivel for the same reason that I do not accept white guilt for slavery. _I_ had nothing to do with it. No one has any control over what happened before he was born, and therefore he has no guilt for it, no matter who tries to pin it on him. Doubt be so hard on Chris Cuomo remember his ancestors killed Jesus. The generational guilt has clouded his judgment. Before U condemn my violent solution of massive force brutally applied … Consider this; my youngest sister was on 72nd floor of tower one … so paint a symbolic red cross-hair target on that ground zero mosque for the lost innocent lost American .. still hunting but there just never seems to be a small tactical nuke warhead laying around when one is needed .. until then can anyone spare a fueled up 747 ? I’m sorry about your sister RussVet. As far as us having to “remember the cruisades”, does that mean they were OK if we must allow such now? Makes not sense. Jihad…what should we call our war against it? Any ideas? 9…Brenda I think it is (can’t spell)Armageddon..but according to the Bible..Christians WIN. Seriously though, these arguments from the left and those supporting Islam are so out of the ball park. How can they not see they are hypocrites? They say cruisades were wrong…so it’s OK for them. It floors me. Maybe someone should tell this guy Cuomo the last of the Crusades ended in the Thirteenth Century. Doesn’t he think it’s about time the muslims caught up with the rest of the world, and just maybe, renounce their jihad against the West? Just wait until all the Christians are raptured up and the left can’t blame us for their problems. They will not stop islam from taking over the whole world. Then they will wake up but it will be too late. They will cry about it, not being able to do one thing. Only submit or die. I feel sorry for you guys. Just know my Christ is in Charge and will take it all back when HE returns with us at the end of the seven year tribulation. We will rule for HIM and the kingdom for 1000 years of peace. You see, MY God died for me, not the other way around like islam demands. Read the bible and compair, don’t take my word for it. btw. we were nice during the crusades. SM: Oh, what were you doing Dolf in the 12th century? During the crusades, they were ahead. btw. Steve Holloway…jesus died, not god.